Forget hybrid, forget electric, and forget roads! Right now, it’s all about flying cars. With Terrafugia Inc’s flying car set to land at this week’s New York Auto Show, another flying car is clearing for takeoff. Dubbed the Personal Air and Land vehicle (PAL-V) and hailing from the Netherlands, the PAL-V is a fully drivable and flyable aircraft that is as much at home in the clouds as it is on the roads. Tired of traffic? Take to the skies and break free of the unending wheel of gridlock you’ve had to suffer through all these years. Of course right off the bat you can see that the PAL-V resembles a helicopter more than a winged aircraft, which is where it breaks away from other flying vehicles like the Terrafugia. 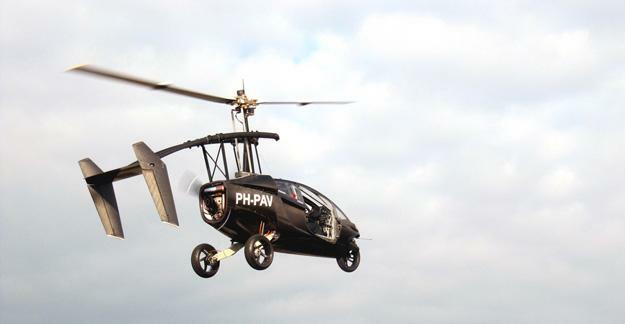 The transformation from car to flying copter-car reportedly takes only a few minutes, although it requires ample space to take off (roughly 165 meters or about 541 feet). The PAL-V is reportedly as easy to operate on the ground as it is in the air thanks to a proprietary Dynamic Vehicle Control (DVC) system, which “automatically adjusts the tilt angle of the vehicle to its speed and acceleration.” According to the company, the flying-car can reach speeds of over 100 mph on land and in the air, and has enough space to carry both a pilot and passenger. “You can drive like a car with your normal car, then you can fly like a plane but in one vehicle, says PAL-V CEO Robert Dingemanse.” So if you want to fly over a mountain you can do that and then drive at the other end and go to your destination or fly over water or past a traffic jam, of course. All those kind of things are possible now,” explained Dingemanse, giving but a few examples of how integrated flight and traditional vehicle technology can provide an unprecedented level of freedom. Perhaps one of the most impressive aspects of the PAL-V is that the flying car is legal both on the roads and in the air — meeting existing international standards for land and air travel. All you need is a driver’s and pilot’s license and you’re ready for takeoff. The three-wheeled PAL-V has been in development since 2008 and is currently looking for interest outside the commercial realm to allow the concept to take flight. Dingemanse is also hoping to attract the attention of military and emergency service sectors into potentially using the flying-car outside the commercial market. According to the company, the PAL-V is set to go into production sometimes in 2014 with no official pricing laid out as of yet, although we imagine it will probably be as high as the vehicle can fly.